Fashion coordination for December will begin with collection pickups from Ray magazine. The theme will be on how to coordinate jacket style coats with shorts or short skirts to for the sweet and feminine look. 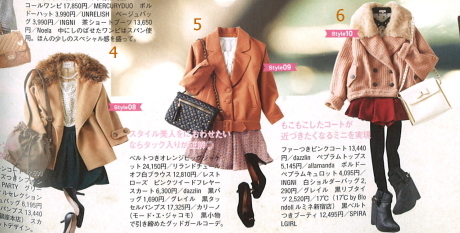 Ray favors some light pinkish & beige tones and casual and fashionable styles, just the perfect style for dates.